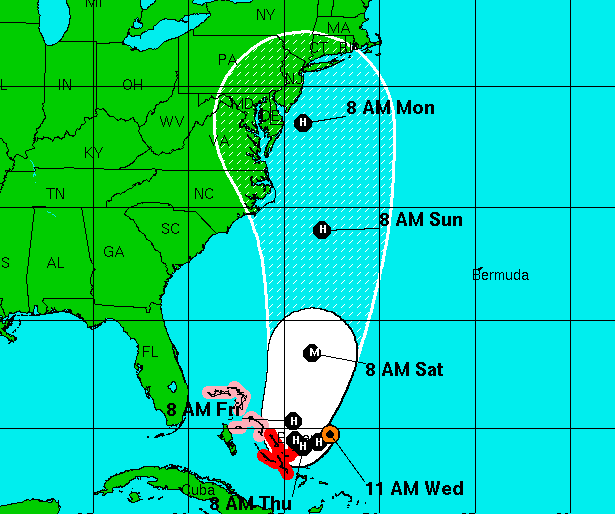 Hurricane Joaquin will take a westward track and strike the New Jersey coast, the 11 a.m. Wednesday update from the National Hurricane Center shows, though – as customary – the forecast is subject to change. Graphics released by the hurricane center indicate Joaquin will be on a direct path toward striking New Jersey southeast coast around 8 a.m. Monday. At that time, the storm is forecast to be a category 1 hurricane packing winds of 85 m.p.h. Joaquin is expected to become what is considered by meteorologists to be a “major” hurricane in the short term, eventually reaching wind speeds of 115 m.p.h. within 72 hours, but then will scale back in intensity before targeting a landfall site. Still, forecasters are hesitant to guarantee the outcome of their current forecast. Should the threat to the U.S. increase, any further adjustments of the forecast to the west would likely be accompanied by an increase in the forecast forward speed, the hurricane center said, with impacts along the coast occurring sooner than currently predicted. A hurricane watch could be required for portions of the U.S. coast as early as Thursday evening, according to the discussion. The forecast was summed up succinctly on social media by chief meteorologist Gary Szatkowski of the National Weather Service’ office in Mount Holly: “Yeah, that’s a problem,” he posted.